Wednesday, the Henan Provincial Geological Museum and the Chinese Academy of Geo Sciences unveiled the monster as they released details of the latest paleontological findings. 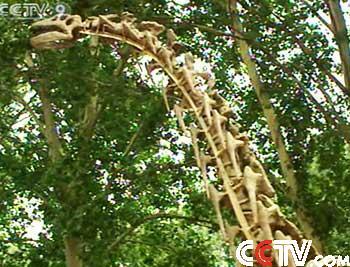 Researchers say as many as 30 dinosaur sites have come to light in Ruyang city, Henan province over the past year. The fossilized remains have been unearthed with the help of local residents. Five sites have been fully evacuated. The scientists believe many fossils belong to two species of dinosaur never before known. For researchers that's exciting.